Is Cuomo Threatening NRA's Existence? He Says: 'I'd Like To Believe It's True' New York Gov. Andrew Cuomo says the National Rifle Association's lawsuit against him is "frivolous." The lawsuit claims that Cuomo's policies are trying to deprive it of its First Amendment rights. New York Gov. Andrew Cuomo, shown here speaking at an event last month, has described the NRA's lawsuit against him as "frivolous." New York Gov. Andrew Cuomo says the National Rifle Association's federal lawsuit against him is "frivolous." The lawsuit claims that Cuomo's policies are trying to deprive the NRA of its First Amendment rights by making it more difficult for the organization to function in the state. Cuomo described the NRA as a "group of extremists" and says he hopes that his actions against the group will expand to other states. "I'm hoping to extend this all across the country," he said in an interview with All Things Considered. "And if they think New York hurt their pocketbook, let's see what happens when the other states also join in." Part of the lawsuit focuses on an NRA-branded insurance program called Carry Guard, which the state's Department of Financial Services took action against earlier this year. For example, in May, the DFS imposed a $7 million fine on the program's underwriter Lockton Cos. because the insurance covered "certain acts of intentional wrongdoing" which the state found to be unlawful. Critics of this kind of insurance policy have called it "murder insurance." "I do plead guilty to stopping the NRA from conducting illegal activity in the state of New York. 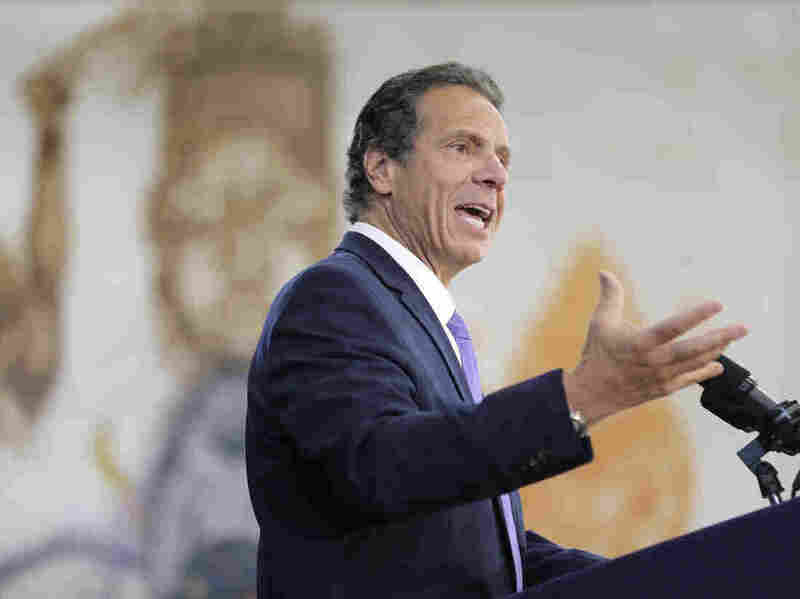 That I will plead guilty to, proudly," Cuomo said. "They're complaining that they lost the commission from selling an illegal product," he added. "It's like a 21-year-old who is selling drugs complaining about the loss of revenue, when the drug sales are stopped." Cuomo has previously tangled with the NRA, including enacting stricter gun laws in New York that he describes as "one of the proudest things that I did." In court documents, the NRA characterized him as a "political opportunist who has consistently sought to gain political capital by attacking the NRA." "The law is the law, red or blue, Democrat or Republican. The law is the law, and this is a product that violated the law and the insurance company itself paid a fine to that effect and the NRA was a broker," he told NPR. "So I don't believe there's any political pressure." Cuomo's actions, the subject of the NRA's lawsuit, are broader in scope than the controversy over the Carry Guard insurance policy. In April, he issued a statement saying that he was directing "the Department of Financial Services to urge insurance companies, New York State-chartered banks, and other financial services companies licensed in New York to review any relationships they may have with the National Rifle Association and other similar organizations." Then, he said at the time, "the companies are encouraged to consider whether such ties harm their corporate reputations and jeopardize public safety." The NRA has said this is basically the equivalent of blacklisting the group. It's characterizing Cuomo's actions as an "attempt to chill the NRA's political speech." It added that making it more difficult to obtain insurance coverage could force the group to shut down NRATV and print publications and magazines. "If the NRA is unable to collect donations from its members, safeguard the assets endowed to it, apply its funds to cover media buys and other expenses integral to its political speech, and obtain basic corporate insurance coverage, it will be unable to exist as a not-for-profit or pursue its advocacy mission," the NRA said in its lawsuit. At the same time, the NRA is generally viewed as flush with cash. As NPR has noted, the group "enjoyed record fundraising success after the Florida shooting." The NRA's alleged financial concerns are drawing mockery on social media. For example, Golden State Warriors head coach Steve Kerr tweeted, "Don't send money......thoughts and prayers should suffice." Does Cuomo think his policies are threatening the existence of the NRA? "I would like to believe it's true," he said, laughing. He said funds, including those from the Carry Guard policy, are a vital tool the group uses to "bully" and "browbeat" politicians. "They need to raise money, otherwise they can't threaten."